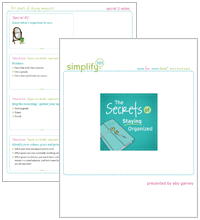 Do you feel like you’re constantly organizing, yet never organized enough? If you’re looking for the easiest ways to stay organized so you can relax and enjoy your home again, then this self-paced, online class is for you! Find out how to break the habits that prevent you from staying organized, and replace them with new habits that make it easy to be organized. Get to the root cause of the obstacles that get in your way when it comes to maintaining organization, so you can implement solutions that will really work. 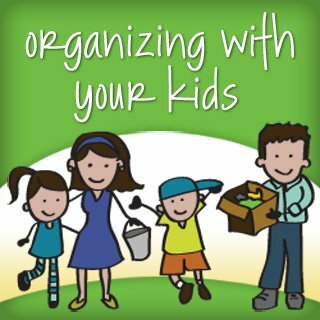 Discover how to get your family on board, so you can work together to keep your home organized. Find out a mindset shift that will alleviate tremendous pressure, especially if you feel like you should keep your home perfectly organized 100% of the time! Discover how to stay motivated so staying organized is easier and more enjoyable for you. Find out how to fit organizing routines into your busy schedule, even if you feel time-crunched and have low energy or motivation. Learn an easy way to make your home feel more organized so you can feel confident about how your home looks, even when people stop by unannounced. Find out how to simplify recurring tasks, so it’s easier to get things done so you can stop putting off important to-dos. Stay organized on your time schedule in small blocks of time. The self-paced format and bite-sized lesson content makes it easy, so it’s the perfect solution for your busy schedule. 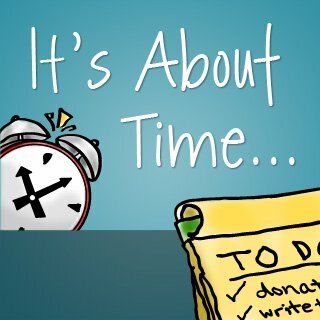 4 hours of instructional videos by professional organizer Aby Garvey. 4 VIDEO modules (approximately 1 hour in length), which are broken down into 21 short viewing segments of 5 to 15 minutes each. It’s easy to fit the class into your schedule and take action without getting overwhelmed. The presentation-style videos (like the video shown on the Summary Tab) give you the chance to see and hear lesson concepts, and take notes, solidifying your understanding of the ideas. Videos can be downloaded and saved to your computer or tablet for viewing anytime, anywhere. Action Guides, notes pages and complete video transcripts (if you prefer reading over watching videos) are provided as colorful, printable, and editable pdfs. You can add notes to your handouts electronically and create a customized action plan for staying organized. Lifetime access to the videos and other course materials on our web site. Materials format: Video (presentation style), written (PDFs of Action Guide, notes pages and complete video transcripts), and audio (MP3). All materials are downloadable. Use the format(s) that work best for you! My name is Aby Garvey and I’m the founder and co-owner of simplify 101. Of all the classes I have created this is hands-down my favorite. The Secrets of Staying Organized video class is the culmination of everything I’ve learned about peoples’ blocks to staying organized. It gets below the surface to the root causes, so you can stay organized on your own terms. I’ll give you 21 of my best secrets. 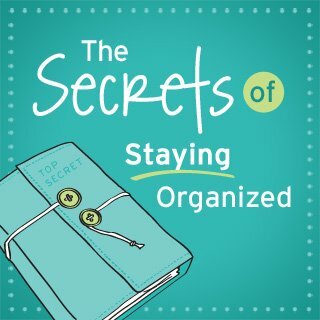 These original, fresh ways of looking at things will show you how to break the cycle of getting organized, getting disorganized, getting organized, getting disorganized…over and over again. These are time-tested strategies that work in my home as well as my client’s. Plus, you’ll find out how to cut through your own personal obstacles and finally be organized. 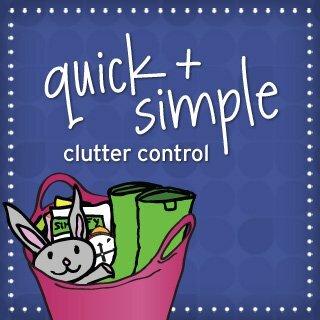 Discover simple techniques that will help you do what needs to be done to keep your home organized, even when you’re not feeling up to it. If you struggle to stay motivated when you’re in organizing maintenance mode, you won’t want to miss out on these easy yet effective ideas. Discover a simple way to figure out the root cause of why your organizing systems aren’t working. And even better, find out a simple way to fix those broken systems so you can stop wasting time and money reorganizing the same problem area over and over again. You’ll also find out how to remember things at the right time, avoid clutter temptations, eliminate visual clutter and be more efficient, using simple tools you already have in your home. In this module you’ll uncover how to stop the perpetual cycle of getting organized over and over again. This one idea is mission-critical if you love the process of getting organized and never feel done. Plus, get ways to make staying organized more fun, so you’re motivated to do the tasks necessary to keep your home organized. You’ll also learn how to break free from procrastination and doing everything yourself, so you can finally have peace of mind when it comes to your home. Please check out the introduction video from Aby (on the Summary Tab). If you can view this video, you’ll be able to view the class content. If you plan to use multiple devices, such as your home computer, smartphone, iPad, etc., please check that you can view the video on all devices.